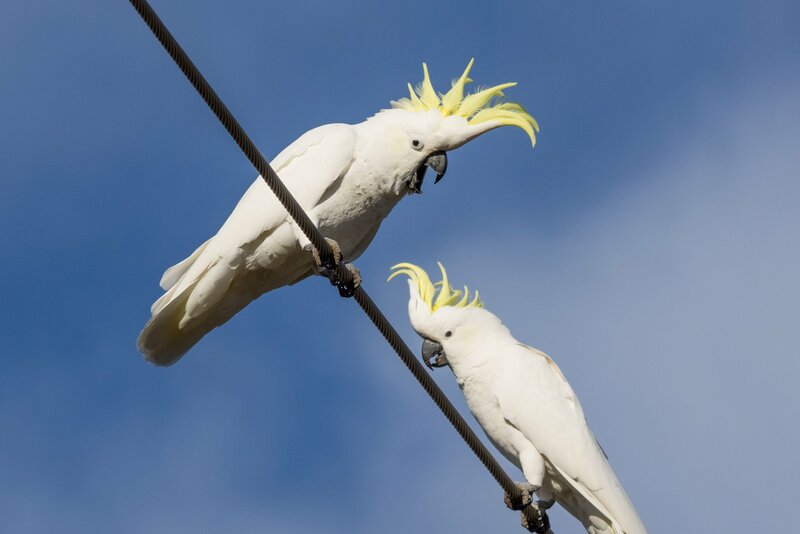 Back in August, I heard a great commotion amongst the local birds around my home in Canberra. I went to investigate and found that the object of all the fuss was a Barn Owl (Tyto alba or Tyto javanica or Tyto delicatula depending on which authority you use). 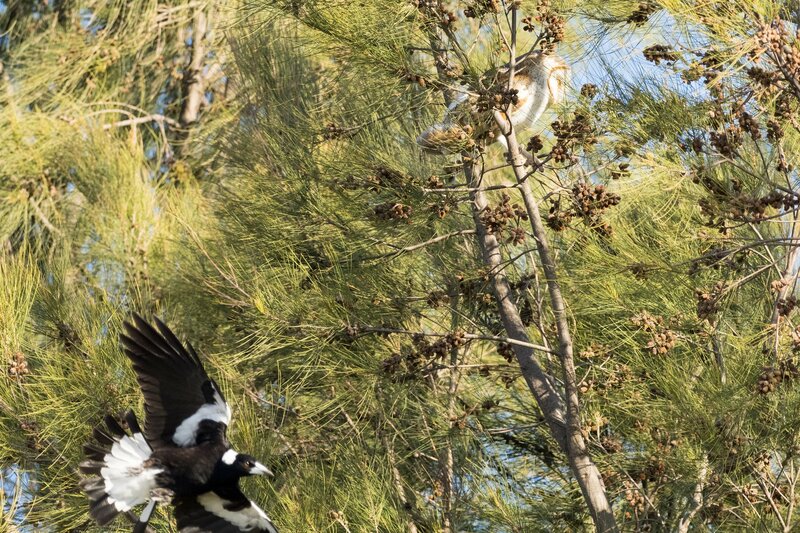 The poor owl was being mobbed by many birds, such as Pied Currawongs (Strepera graculina) and Australian Magpies (Gymnorhina tibicen), but the most vicious and persistent of the attackers was a pair of Australian Ravens (Corvus coronoides). The ravens were extremely vicious. Eventually it flew into a tree where it managed to find shelter from attack, and the mobbing birds mostly gave up. It stayed there till dark. There was no sign of it next morning. 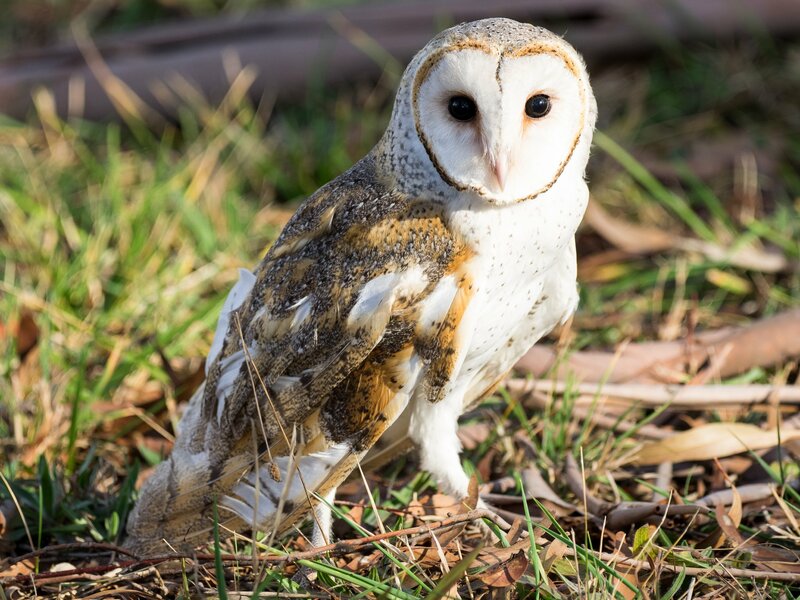 Barn Owls in Australia are irruptive. When conditions are good they breed up, then disperse and crash when a drought such as the one we are in hits. They don’t usually occur in the Canberra region except when they are dispersing from further inland. They are often harassed and injured to the point they can no longer fly. If they are lucky, a kind person will rescue it and take it to wildlife carer to rehabilitate. The local wildlife carers have been quite busy with injured Barn Owls. This entry was written by whyevolutionistrue and posted on December 4, 2018 at 7:30 am and filed under birds, photography. Bookmark the permalink. Follow any comments here with the RSS feed for this post. Both comments and trackbacks are currently closed. Nice collection of photos capturing a fascinating piece of behaviour! That barn owl has invalidated her warranty – the user user manual clearly states she’s a nocturnal bird. Poor thing! But very good documentation of these events. I did not know that barn owls occurred there. Sadly, though, they’ve been essentially extirpated from Michigan. I wonder how they maintain species integrity across the oceans. You’d think, since they don’t like it too cold, the western and eastern populations would diverge. Goodness. Looks like they won’t venture far into Canada! Well that explains why there weren’t any Aussies at Hogwarts. 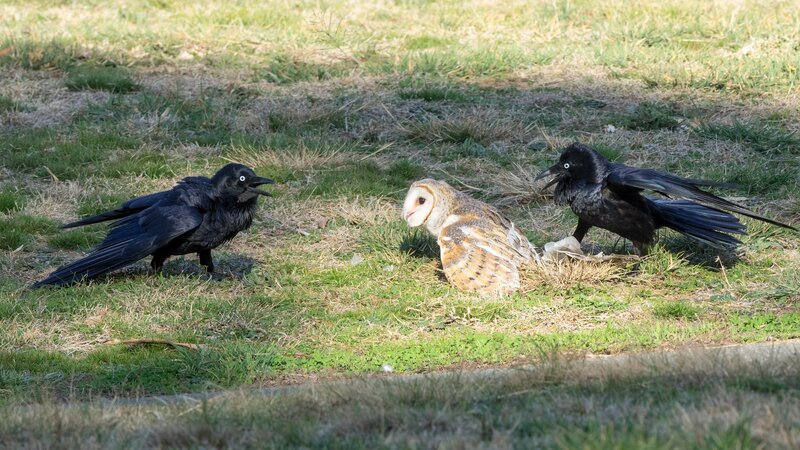 Great photos—especially the one of the ravens nipping at the poor owl, who I hope will have a happier life henceforth. Fascinating. A well documented drama. Thanks. 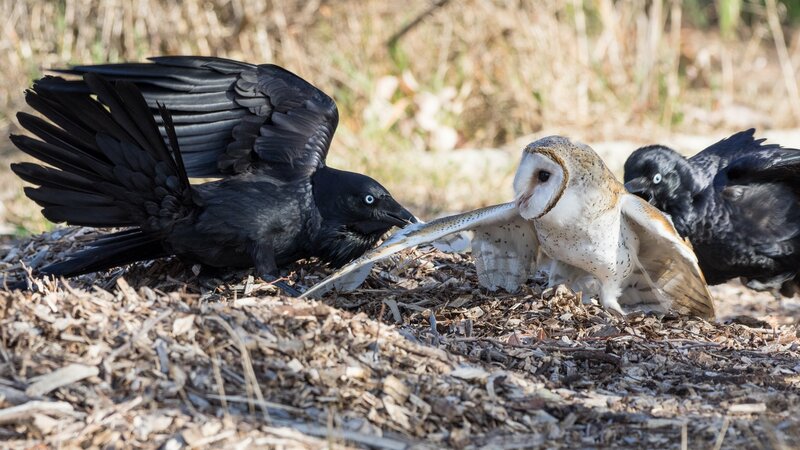 Australian ravens vs barn owl. Great photos. 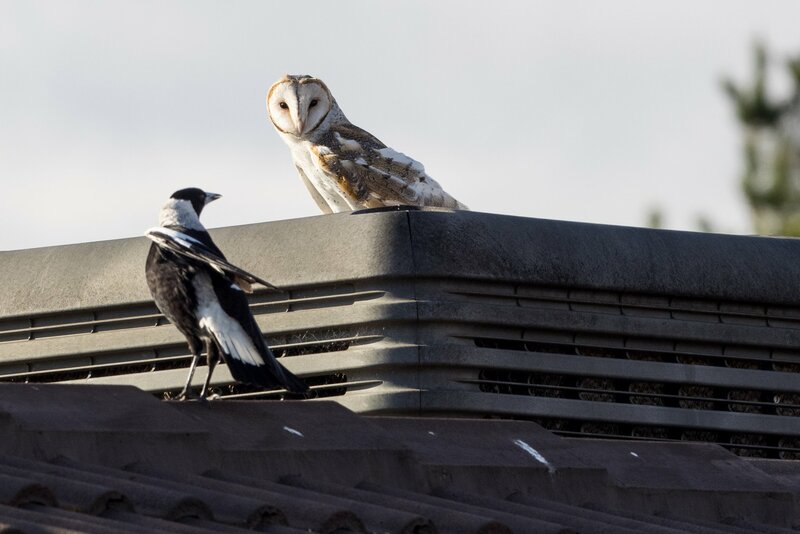 They raise the question of why the ravens and magpies are mobbing the beautiful barn owl. 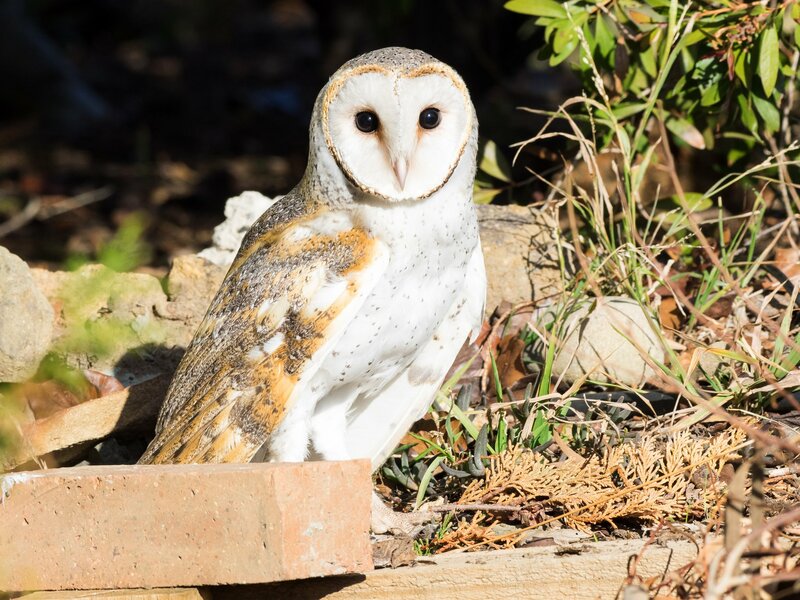 Wikipedia: “Barn owls specialist in hunting animals on the ground and nearly all of their food consists of small mammals which they locate by sound, their hearing being very acute.” So it does not appear to be competition for food, or even defense of eggs and nestlings. I had naively assumed there was some good evolutionary incentive for the examples of bird mobbing I have personally witnessed. Can the ornithologists out there enlighten us? Hear, hear–or here here, whichever it is. I don’t understand why so many different other birds were taking the time out of their busy days to harass the barn owl–and why that’s apparently very common in that area. I suspect raven offspring are pretty vulnerable at fledgling stage, like those of most other birds. Birders know to go looking for the cause when a group of crows is heard loudly scolding something. Most of the time they’re harrying a Red-tailed Hawk, maybe another species of hawk, but once in a while it’s an owl. Corvids aren’t the only taxon that does so, either. 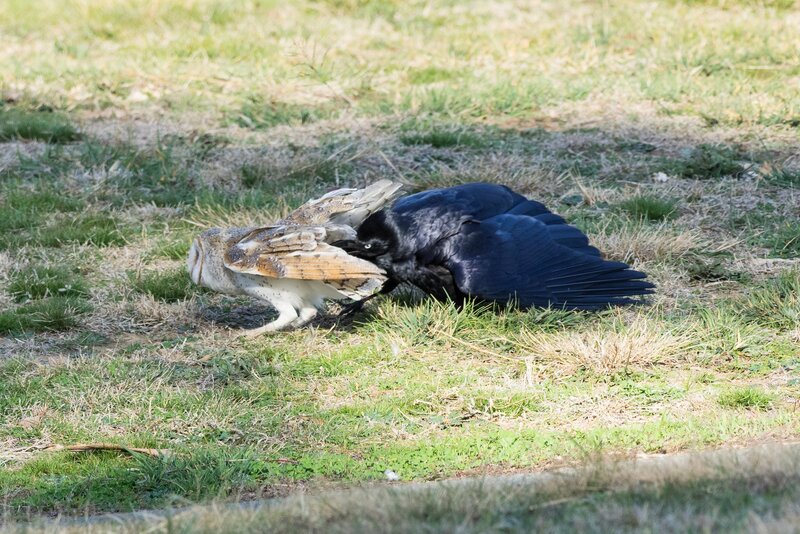 This behavior is called “mobbing,” because usually it’s a small mob of birds taking on an owl or hawk; the (US) Eastern Kingbird is rather notorious for taking on large hawks solo, though! Here in Idaho, as of this fall and winter, the red-tailed hawk is bothered a bit by the magpies. Not too aggressively. I suspect during nesting it will get much worse. Fascinating pics and stories, Duncan! Those Australian Ravens and Magpies look like formidable opponents! In the US we have some diurnal owls but the Barn Owl is not one of them. Do they behave that way in Oz, or is it possible this owl was already weak or debilitated in some way? Barn Owls here are nocturnal. We don’t have any diurnal owls in Australia. They don’t appear to be very effective at getting away from harassers in the day, making them vulnerable to being badly injured. The ravens easily drove the owl to the ground. The raven pair were nesting nearby, which may have made them extra aggressive. I don’t think Barn Owls are a threat to large birds like ravens, but the much larger Powerful Owl will take sizeable birds roosting at night. It surprised me which birds get harassed and which don’t. While all this was going on, there was another bird of prey nearby – a Black-shouldered Kite – which was left completely alone. Like Barn Owls, Black-shouldered Kites mostly take mice. Interesting about the kite! Over here I’ve not heard of (or witnessed) birds mobbing our smaller raptors like Cooper’s & Sharp-shinned hawks, either, though both spp dine on birds themselves. I’d bet the fact that the ravens were nesting nearby did contribute to their aggression.